On how the coffee market for those who love to make it at home has changed, and we are all about it! It’s great to know that you can have your favorite milk-based drink whenever you want, and having a manual milk frother at home gives you the option to do one up whenever you feel like it. On the market you can find some frothers that are completely automated, as well as those that are operated by hand. The automated variety not only froths the milk, but can also brew coffee beans for espresso after every highly-sought after drink. If you are looking for something that still has unique flair and style but is a bit easier on the monthly electric bill, a manual milk frother works just fine. Remember, there were many who enjoyed prime beverages that still tasted stellar before the industrial revolution, and way before we had smartphones and 550 channels on television. When products rate themselves, they are always going to rank themselves very high, and so you have to use the product and talk to others who have to find out if it will work well for you. Here are some that we found on the internet, and details on whether you’ll be delighted at your outcome or maybe should have found another model for your own kitchen. 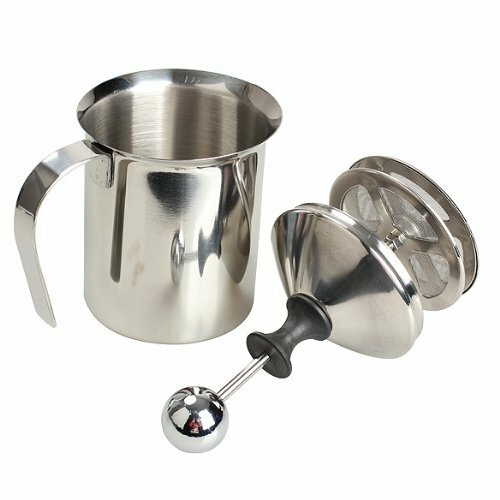 A manual milk frother that is simple in appearance, but still good quality, you can easily get two lattes out of this one. Users have stated that after using it and learning it’s rhythm, they got high quality and great tasting results that were a bit like beaten egg whites with a dash of true coffee shop upper-end taste. The more pumps you give this one the stiffer fluff you get as your result, and fat-free or 1% milk will give you the best outcome. You also get the best froth with about an inch of milk during the start, and one of its only drawbacks is that it simply does not appear with as much extras and upper-end detail as others you can acquire at higher prices. Just as many manual milk frothers, when you are pumping, the mesh wheels will knock on the lid, and this will make a bit of noise. Pumping it on a towel is best because some liquid can escape the edges and neck, which is not entirely out of the ordinary. The glass changes the feel of this manual milk frother entirely, and it is still in a low pricing point, but double of what you get for the lowest. Sometimes the decision between this and stainless is really a matter of preference: this one seems much newer, with a bit more progressive decor then other models. 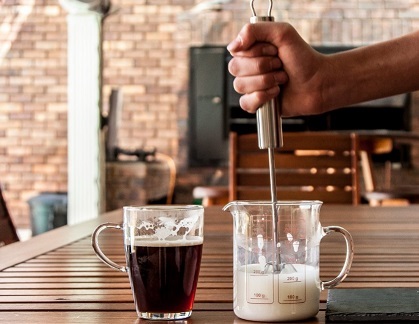 Users like this manual milk frother for its comfortable grip, and for the fact that you can whip up the milk that is best for your beverage in under a minute. For this one you fill it up with about 8 or 10 oz. Of cool milk, and just place the jug on a flat surface. Then, you place the lid onto the jug, and close the pouring outlet. You run the plunger up and down, and an average of about 60 times is what makes for good quality froth. Afterward, you can just microwave the froth if you are wanting a drink for the cooler times of year, and you just spoon out the blissful results into your coffee. 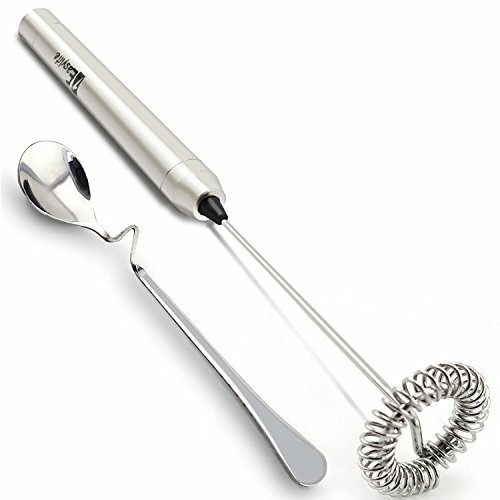 The weight of this manual milk frother is right at around one pound, and many users rank it as having a very excellent design. It is said that you may not want to use almond milk in this and many other manual milk frothers, and some of the best of baristas enjoy using this one instead of models that have plastic rings on the bottom. You can see the milk while its frothing, and this, for the price, was “the one” for a very choose connoisseur who really knew her way around a fully-equipped coffee shop. The glass on this model is a bit thin, but our staff told us not to be worried about the claims that it doesn’t work well enough. After you use it, the foam will hold for hours, and if you use a French Press with ground espresso, you’ll get a perfect latte. 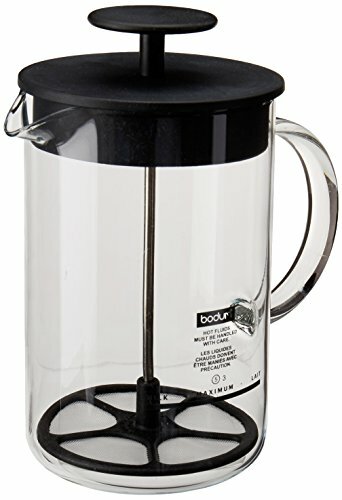 If you must use it with Soy milk you will find that it may not have as good as consistency as it could, but this one’s ease of use and the fact that it can churn out the best that some had had outside a coffee shop rank very high for the Bodum. One of the best things about this manual milk frother model is that you can simply rinse it under the tap and wipe it dry, and is one of the most compact milk frothers out there that does not require battery power. You can also use it for eggs and protein shakes, and branch out into making healthy alternative such as protein shakes. The weight is only 5.6 oz, and you can use it for delicious goods such as mango pulp, yogurt, and milkshakes as well as your favorite coffee beverage. You can enjoy your morning cappuccino even more with this device, and many who first purchase it are surprised that it doesn’t require power. You can even use it to make other delicious additives like gravy and hot chocolate, and you can get a great chai tea out of it with organic powdered milk. Just make sure that the bowl you are working with has enough room to accommodate it, and you’ll be quickly in business.